The closure of Longannet or Peterhead power stations is set to be postponed by a deal to secure generating back-up. 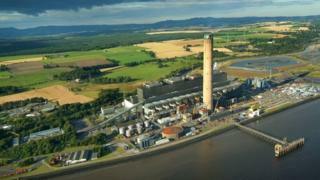 The giant coal-burner in Fife was facing earlier closure than expected, with its owner, Scottish Power, blaming the expense of connecting to the grid. However, National Grid has conceded it needs back-up to avoid power failures if the wind drops and Scottish wind turbines do not produce energy. It is negotiating with owners of gas and coal-burning power stations. This now means only Longannet and Peterhead, owned by SSE. The Cockenzie coal-burning power station in East Lothian recently closed, and oil-burning Inverkip in Inverclyde is being demolished after hardly any use. The problem of back-up has arisen because conventional power generation in Scotland is being shut down due to age, high emissions and cost. However, the grid connections between Scotland and England do not yet have the capacity to make up the shortfall in Scotland if demand outstrips available supply. A multi-billion pound project to install extra capacity is under way, including upgrades of the existing high-voltage landlines, and a 'bootstrap' subsea cable between Ayrshire and Merseyside. That extra capacity will be able to transfer renewable energy from Scotland to English cities. When the wind drops, the power flow can be reversed, and thermal or nuclear generators in England and beyond can help to meet Scottish demand. However, until that capacity is in place, the National Grid has calculated there is enough risk of a voltage shortfall that it needs to make plans to avoid that. That remains a very low risk, calculated at one event in 600 years. Given the growing dependence on intermittent renewable sources of energy, the transmission company is asking generators to bid for payments to provide standby power quickly. SSE was preparing Peterhead station to be part of the first bidding process for supply back-up last year, but it failed a technical test. Following controversy about the future of Longannet, National Grid has issued a statement, saying that it carried out 140 tests of the system, along with subsidiaries of SSE and ScottishPower, which control the grid network in Scotland. The tests simulated extreme weather without either Longannet or Peterhead available, and found there was a chance of power failure. "To ensure that we can maintain system stability, in even the most extreme circumstances, we are in discussions with thermal generators in Scotland to procure some additional voltage control support, from April 2016," the statement read. "A final decision, outlining our plans, will be announced by the end of March 2015." A Scottish Power spokesman said: "We are engaged in this commercial process. All discussions relating to this are confidential until National Grid make their final decision". Although a privatised company, owning and running most of the high-voltage network, National Grid also carries responsibility for ensuring power supply and voltage is maintained throughout the country. Energy planners say that nuclear power is not suitable for back-up power. From a position of being switched off, it would be much slower than coal or gas to build up production in response to unexpected shortfalls in renewable output. What is the National Grid and why does it cost to connect to it?